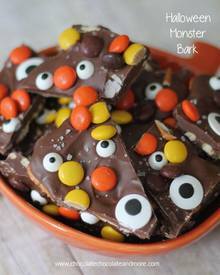 Salted Halloween Monster Bark-Chocolate Candy Bark and pretzels decorated with Reeses Pieces, Monster Eyes and sprinkled with a little Sea Salt. Making candy Bark is just the obvious, and the easiest, choice. A little salty, a little sweet. Of course it’s chocolate. And the eyes. They make it fun. You can use any additions you want. I had a box of the Reese’s Pieces in the cabinet. You can never go wrong with that chocolate/peanut butter combination.